It’s not very pretty, but it sure is good. If you’ve read my blog before, you know this dish doesn’t really fit in. I told Adam it may be the most American thing I’ve ever made, but he asked for it this morning because his mom used to make it, and who am I to argue? I asked his mom for her recipe and, of course, had to add my own twist. The result? A very comforting, very cheesy, super delicious casserole, perfect for football Sunday. His mom’s recipe uses Velveeta, but I can’t/won’t eat that, so I put it on only half because Adam REALLY likes it. Preheat oven to 400 degrees. Brown the ground beef in a cast iron skillet. Add the onions and cook until translucent. Stir in diced tomatoes, ketchup and mustard powder and mix well. Fry up the bacon and prepare the noodles to al dente. 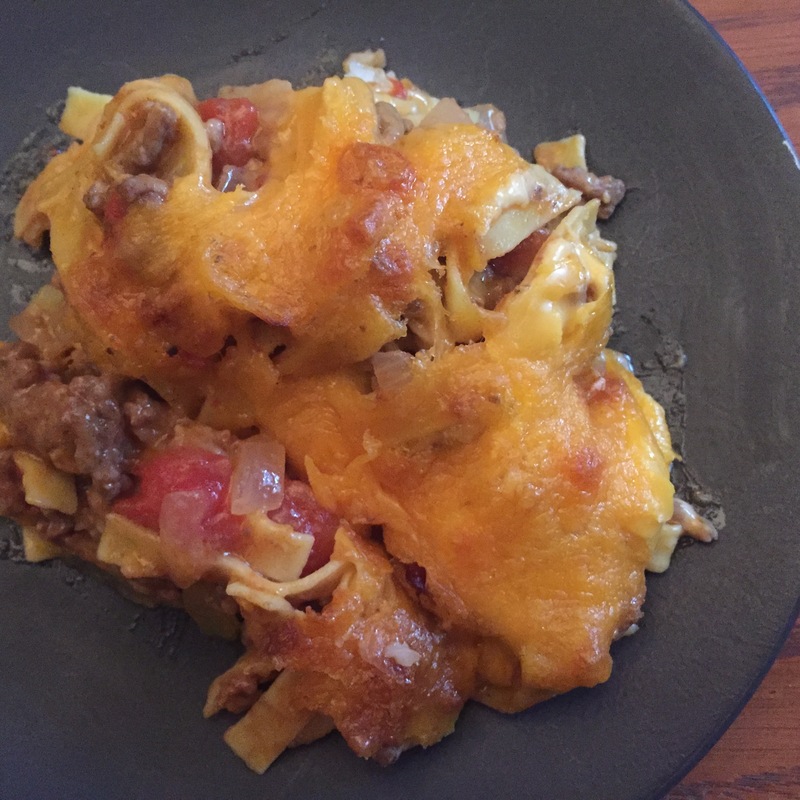 In a large bowl, mix the ground beef mixture with Fiesta Cheese Soup, noodles and bacon. Mix well. Line the bottom of a 9 x 13 casserole dish with crispy crowns. Pour in beef mixture. Top with Velveeta and shredded cheddar cheese. Cook for 20-25 minutes, or until cheese is bubbly and casserole is cooked through.